Dalzell Hatfield Galleries, Los Angeles. Viktor and Marianne Langen, Meerbusch (acquired from the above, 1985). By descent from the above to the present owners. Galerie Maeght, ed., Catalogue de l'oeuvre de Georges Braque, Peintures 1936-1941, Paris, 1961, p. 53 (illustrated). V. and M. Langen, Kunst des 20ten Jahrhunderts: Sammlung Viktor u. Marianne Langen, Ascona, 1986, vol. I, p. 91 (illustrated in color, p. 92). J. Leymarie, Braque, les ateliers, Aix-en-Provence, 1995, pp. 99-100 and 229 (illustrated, pl. 26). New York, Paul Rosenberg & Co., Georges Braque: An American Tribute, The Thirties, April-May 1964, no. 31 (illustrated). The Art Institute of Chicago, Braque: The Great Years, October-December 1972, pp. 22 and 76, no. 24 (illustrated in color, pl. 11; illustrated again, p. 76, fig. 59). Lugano, Museo d'Arte Moderna, Passioni d'arte da Picasso a Warhol: Capolavori del collezionismo in Ticino, September-December 2002, p. 198 (illustrated in color, p. 199; illustrated again in situ). Le Modèle is one of the magnificent paintings of interiors Braque created during the late 1930s, which have since become widely renowned as the most complexly conceived and beautifully rendered compositions the artist had done since his cubist period a quarter century earlier. Just as Braque, together with his friend Picasso, were on the eve of the First World War mining the possibilities of high cubism in its newer synthetic phase, so he had again arrived at an especially productive juncture in his career, during which he was summing up and further enriching those characteristic qualities of the intervening years that had set apart his work from the more loudly insistent modernist brands of the day, as he sustained his uniquely quiet, contemplative and deliberative approach to painting, a phenomenon all the more remarkable in light of events of the day, as Europe was once again nervously sliding toward the inevitability of catastrophic conflict. "At the time of the outbreak of the Second World War [September 1939] Braque was at the zenith of his maturity and had attained international recognition as one of the greatest living French artists," John Golding has written. "The still-lifes executed in the second half of the 1930s are among the fullest and most sumptuous in the entire French canon. Simultaneously Braque was enlarging his iconographic range by producing a series of interiors furnished with still-lifes, many of which refer to attributes of the painter's studio--easels and palettes proliferate--and also frequently by human figures or presences" (in Braque: The Late Works, exh. cat., The Royal Academy of Arts, London, 1997, p. 1). Braque's Le Modèle is clothed, and her presence suggests none of the demi-mondaine inferences that one normally associates with artists and their models. Seated en majesté, enthroned against a luminous field of green, she exists on an altogether more exalted plane. Braque has rendered her visage in radically configured chiaroscuro, lit en face but also backlit as a silhouette in profile, with both views conjoined as one. This visual metaphor suggests that she embodies an inner dual nature. Her presence is on one hand corporeal, but on the other she is also a mythical sphinx-like player in the creative impulse that the artist feels unfolding within himself. She is woman as muse, as inspiration; she is the supreme patroness who guides and rewards the painter's efforts. The model is seen sitting in the artist's studio; the usual relevant accoutrements--easel, palette and brushes--appear in the darkened right hand portion of the canvas. She and all else in this strangely illuminated den are indeed veiled in the aura of mystery. Notwithstanding the hard-edged clarity with which Braque has painted the pictorial elements seen here, there is no consistent or otherwise defining perspective. Even the most strongly contrasting elements morph easefully, magically, one into another. Most enigmatic of all is the very un-Braque-like drawing the model holds up to the viewer's attention, pointing to it with the tip of her pencil; it resembles some sort of recondite abstract schematic, as if she had just been applying the lessons of Kandinsky's didactic Bauhaus treatise Point and Line to Plane. Kandinsky, by the way, having left Nazi Germany at the end of 1933, was now living in Neuilly-sur-Seine, a suburb of Paris, and in 1935 had exhibited paintings together with Braque and other French artists at the Kunstmuseum Luzerne (see lot 4). In Le Modèle and other works of this period, Braque displayed an evolving preference for orchestrating a virtual pictorial symphony, a canvas that is a world in itself, brimming with multiple themes, in which figure and still-life elements dovetail and intertwine within their setting like the polyphonic lines in the music of the high Baroque. Indeed, Braque possessed a highly refined and knowledgeable interest in music, and was especially drawn to the French composers of the early 18th century--Couperin and Rameau chief among them--whose music was still a rare taste during the first half of the 20th century. The musician Braque cherished above all others, however, was that supreme giant of the late Baroque, Johann Sebastian Bach, whose name he inscribed in homage on a cubist painting (Galerie Maeght, ed., Georges Braque: Le cubisme, 1907-1914, no. 122) and inserted into three papiers collés, all executed during 1912-1913 (nos. 165, 166b and 199). "The senses deform, the mind forms," Braque wrote in his collection of 'Thoughts on Painting,' published in 1917. "Work to perfect the mind." And more famously he declared: "Nobility comes from contained emotion... I love the rule that corrects emotion" (quoted in C. Harrison and P. Wood, eds., Art in Theory, 1900-2000, Malden, MA, 2003, p. 215). During this mid-career flowering of formal and thematic synthesis that brought forth Braque's interiors of 1936-1939, there is a primary contention in his painting was between the profusion of objects he chose to treat--resulting in multiple contrasts of imagery and form--and a pronounced sense of inner discipline that compelled him to instill order and harmony among these various components in his pictures. If these diverse threads of motivic elements are the melodies that Braque has set down to compose upon, then the painting itself is that symphonic orchestration which most clearly brings them to light. In this regard Braque was as masterly in his pictorial craft as his contemporaries Debussy and Ravel were in art of musical composition, creating works that are subtle, delicately nuanced, luminescent, and crystalline, qualities when lend a singular and unmistakably French voice to modernism in the arts during the 20th century. The overlaid, often jagged but flattened forms in these interiors may well suggest that these elaborate compositions are, in their way, the synthetic cubist paintings that Braque's wartime service, and the consequences of the serious head wound he suffered at Carency in 1915, did not allow him to paint. Braque's dedication to formal clarity is one side of the creative coin in these works; the flip side stems from another significant development in his painting during this period. "What is clear from these series of the late '30s is that Braque's work was growing cryptically personal," Edward Mullins observed. "It was also becoming less literal in its presentation of material things. Braque's world had always been one of objects, in particular objects close enough to touch. Henceforth, a metaphysical note was sound increasingly loud in Braque's painting, for the first time images appear which either have no material existence, or else they have become detached sufficiently from that material role to introduce ideas that dwell outside the physical boundaries of Braque's theme... The introduction during the late '30s of this metaphysical element into Braque's material world ranks as the second momentous innovation of his career (the first being his contribution to Cubism) and it paves the way for that series of noble and mysterious still-lifes, in some respects the summit of Braque's achievements, the [post-war] Studio series" (Braque, London, 1968, pp. 135-136). Pursuing his dedication to the formal and contextual aspects of the still-life genre, Braque tapped into a tradition that was profoundly French. He was certainly the most devoted and conscientious of heirs among the great modern painters to the legacy of Jean-Baptiste-Siméon Chardin, the father of the French nature morte, who was also a contemporary of the musicians whom Braque most admired. While painting Le Modèle, Braque was surely acknowledging the gentle and humble human presence in Chardin's figure paintings. Tracing the line of precedents and influence further back to a more distant generation, one should also consider Braque's allusions to Jan Vermeer (fig. 1). The Dutch master had long been considered a "painter's painter," but since Théophile Thoré's pioneering study published in 1866, and others written around the turn of the century, Vermeer rapidly assumed the status as one of the greatest Dutch artists who worked during the 17th century, who today vies with no less than Rembrandt himself in the minds of many as a personal favorite. Philip T. Hale's important Jan Vermeer of Delft, first published in 1913, was revised and brought out again in 1937. Ironically, it was during this time that Han de Meegheren, the notorious art forger, was at work creating his Vermeers, fakes to which he confessed following the Second World War. While there is a gulf of three centuries separating the formal idioms and techniques of Vermeer and Braque, the pictorial elements in their paintings are strikingly similar, starting with the interior as the painter's chosen realm, and ultimately the ability of each artist to generate a signature intensity in his use of color, as transfigured into light, which emanates from his paintings. A third painter whose presence is detectable in Le Modéle and other figure subjects of the late 1930s was another of Braque's favorite painters, as he was of Picasso as well, a second Jean-Baptiste--namely, Camille Corot. Here Braque makes reference to Corot's late series of six atelier paintings done in 1865-1872 (e.g., Robaut no. 1557). Braque had been an admirer of Corot's figure paintings since his cubist period; he and Picasso together viewed the twenty-four paintings included in Figures de Corot, a special exhibition at the 1909 Salon d'Automne. Corot had been an important influence on the development of Picasso's neo-classical figure style during the late 'teens and early 1920s, and his work was now again attracting Braque's notice as the latter sought to introduce the presence of the figure into his compositions. The last time Braque had painted the female figure was in his monumental Canéphores, ("Basket Weavers"), 1922, and women bearing fruit, 1923-1924, subjects he derived from antique statuary, in depictions that display the gigantism characteristic of Renoir's late nudes and Picasso's neo-classical women. Braque's new approach to the figure during the late 1930s, however, avoids such specifically classical references, taking on instead a thematic subject from the immediate sensory world of the painter: the interior, more specifically the artist's studio. Partly through his allusions to past masters, Braque suggests that this pictorial universe, while of the moment, also transcends the here and now, and--as in Le Modèle--betokens a more profoundly indefinite, timeless dimension, revealing the inner mythology and dynamics of the artist's creative mind. 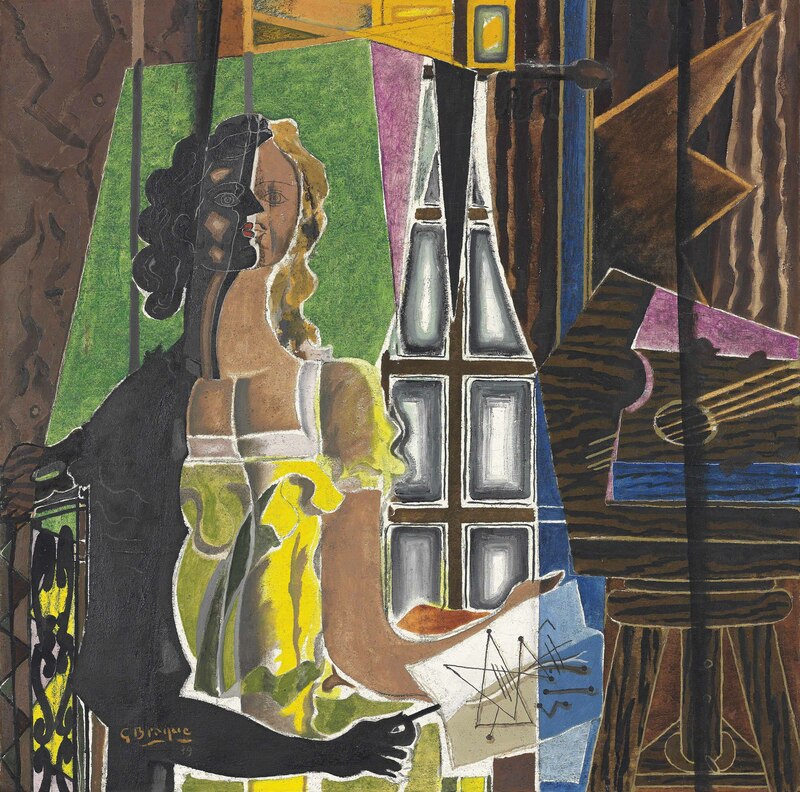 The female presence first entered Braque's late 1930s interiors in the painting Femme au chevalet (Paravent jaune), 1936 (Galerie Maeght, ed., op. cit., p. 1; fig. 2), which shows the bi-partite formulation--half light, half shadow, profile and frontal view combined as one--in which the artist conceived the figure, a brilliant yellow field behind her, and the various studio elements to her side, in the present Le Modèle. Two further pictures close in on the model, portraying her both at bust-length and as a head shot (pp. 2 and 2B). She is in these earliest appearances not actually a model, but apparently an artist herself, as also seen in Femme à la palette of the same year (p. 3). Braque's women throughout this series display evidence of their creative inclinations and abilities. She plays a mandolin à la Corot (pp. 4  and 16 [1937; fig. 3]) or sits at a piano (accompanied by a singer, p. 15 [fig. 4], and solo, p.17 [both 1937]). She subsequently assumed the role of model in the present painting and in the apotheosis of this series, Le peintre et son modèle, 1939 (p. 52; fig. 5). Braque was concurrently working on important still-lifes, some of the finest works of this kind he had done since the height of his cubist period. His female model reverted to her original guise as la femme-peintre in the final painting in this pre-war figure series, La femme au pinceau, 1939 (Galerie Maeght, ed., op. cit., p. 54; fig. 6), which moreover unites all Braque's preceding subject themes--figure, studio-interior, painting paraphernalia and still-life elements--on a single canvas. The double reversal of role-playing to which Braque treated his femme-peintre-modèle, with its suggestion of professional gender transposition, indeed most rare and unusual in the male-authored art of the 19th and 20th centuries, is perhaps the most fascinating psychological aspect in this figure series, but one which has been rarely addressed. One may begin with the semiotic irony that both peintre and modèle are masculine nouns in French. Braque was perhaps summoning into his studio the spirit of Tiresias, the great sage and seer of classical antiquity. He was born a man, but for an indiscretion he committed against the goddess Hera was turned into a woman for seven years, served as her priestess and even bore children. Braque is perhaps making light of a comment Picasso once made, for which Mme Braque never forgave him, in which he referred to his erstwhile partner in cubism as his "ex-wife" (J. Richardson, The Sorcerer's Apprentice, London, 1999, p. 181). The female figure made a one-time only return appearance in Braque's wartime paintings, in La Patience, 1942 (Galerie Maeght, ed., Catalogue raisonné de Georges Braque: Peintures, 1942-1947, Paris, 1961, p. 1), in which she plays a sad game of solitaire, or perhaps engages in card-reading as fortune-telling, seated alone at a café table. The femme-peintre-modèle had disappeared with the onset of the war and the ensuing German occupation, a period of great privation and fear for Braque and most everyone else in France, Picasso included. While both artists persevered and continued to create notable and moving works, the beneficent muse of the pre-war era had unfortunately taken flight and departed for the duration. In studying Braque's oeuvre in overview, one becomes aware of the high personal standards he continually set for himself and projected in his work. In the benchmark interiors of the late 1930s he even managed to surpass himself, and arguably most all other painters active at that time, while rivaling, once again, no less than Picasso himself. "Braque was not only consistently creative and original as an artist," Douglas Cooper declared, "but also, in my opinion, the most consummate pure painter of the School of Paris, a great artist who modernized and enormously enriched the French tradition of painting... Braque's was not a showy personality...his painting was never provocative or sensational and was always deeply serious...he pursued to the end his own vision of the world and his own conceptions of picture-making, unswayed by the methods of others" (exh. cat., op. cit., 1972, p. 26). Jessica Fertig, Specialist in Impressionist & Modern Art, discusses Georges Braque’s Le Modèle, to be offered in the upcoming Impressionist and Modern Art Evening Sale on May 6.